This is a well-made video collection from a professional ESL instructor who has won several awards. These videos cover a variety of beginner grammar topics in depth with slow speech and useful slides with audio transcript or examples. This page includes 6 interactive games as well as general information about the parts of speech, punctuation, spelling and other grammar topics. 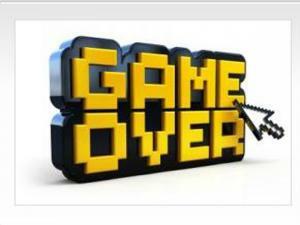 Enjoy the fun games. 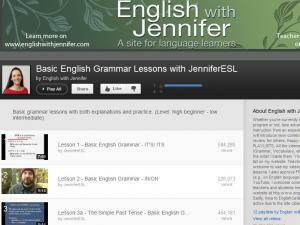 This is the YouTube channel of a professional English teacher. 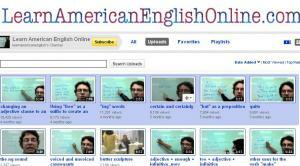 Each of his videos covers a specific grammar or pronunciation topic. The videos are simple but well-explained and very clear. See if there's a topic you need help with! 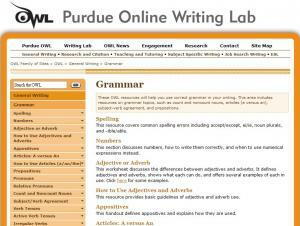 This site focuses on all aspects of grammar, including the terms we use for grammar. 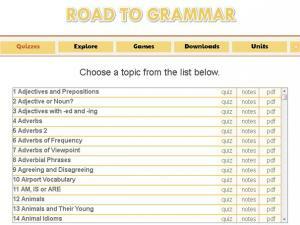 There are many quizzes on specific grammar structure to check your grammar knowledge. 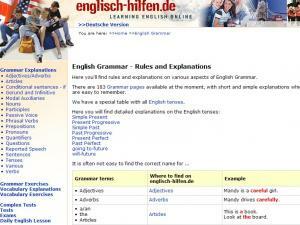 This page is constantly updated with a new lesson about English grammar for intermediate learners. You can access all past lessons from this page, too. With all these lessons, you'll be an expert in no time! This is a general quiz to test your grammar skills and understanding. Read the questions carefully. When you have made you choices, click "Finished" to see a score out of ten. This is a page from the Okanagan College (Canada) ESL Department. 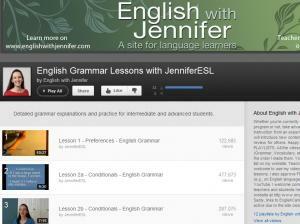 These are informative videos by an experienced teacher with interactive aspects. 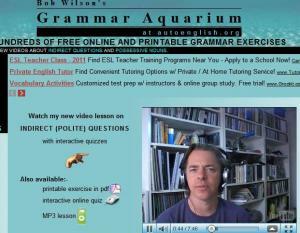 In addition to listening to the lesson on intermediate or advanced grammar you can click on the video to see extra examples and each lesson includes one or two quizzes to take at the end. engVid.com has a collection of over 200 video lessons on a wide variety of topics - from speaking tips to grammar lessons to TOEFL test preparation. 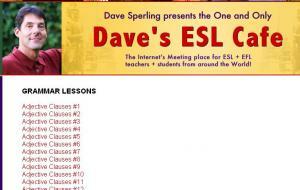 A group of experienced ESL teachers conduct the online lessons and there is often a quiz after the lesson. This website is a great place to review certain topics and has many exercises for practice. 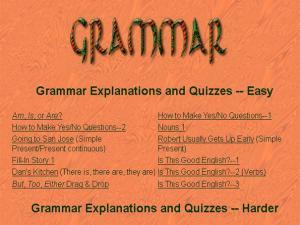 However, the explanations are not very detailed; do not use these pages to learn new grammar topics for the first time. 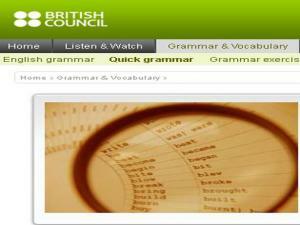 This is a complete grammar reference from British Council. It mainly uses examples from British English. 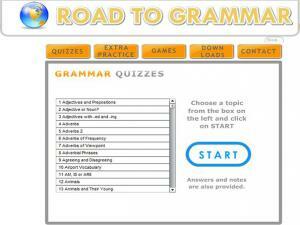 You can read the grammar topics and complete the interactive exercises. 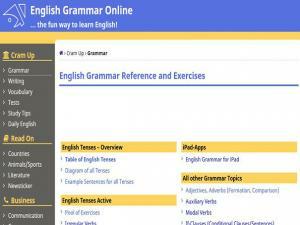 Provides tutorials and exercises on various grammar topics. This is an easy-to-use reference page for all the Parts of Speech. Very handy to bookmark in your Internet browser or print for reference in class. 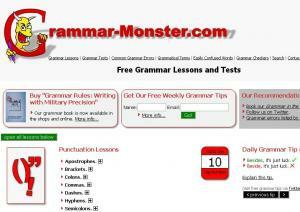 This is an index of free English grammar lessons and short self-tests. In each lesson there are some examples of proper and improper uses, including examples from everyday life, like newspapers and store signs. This website provides a complete list of all the parts of speech and examples of each. Each one has a link to a very brief summary about the specific part of speech. 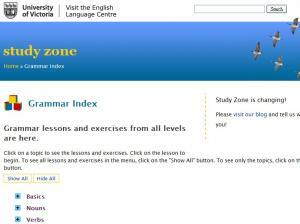 This is the index for all grammar lessons on the site. There are tons of topics and all the lessons are very thorough with many examples. Definitely worth a look for any learner! This is a well-made video collection from a professional ESL instructor who has won several awards. These videos covers a variety of intermediate and advanced grammar topics in depth with slow speech and useful slides with audio transcript or examples. A great website that gives you lots of exercises to test your knowledge in more advanced areas of grammar including, Comma Splices & Fused Sentences, Parallel Structures, Misplaced and Dangling Modifier and Subject-Verb Agreement. All the Exercises have an accompanying handout that you can print out and use as a later reference. EasyEnglish.com is a free self test site for all levels of English learners. Choose easy, medium or difficult settings and then choose your topic. From basic vocabulary to complicated verb tenses, it's all here! The self tests will check themselves and offer you explanations for wrong answers as well as suggestions for future study. 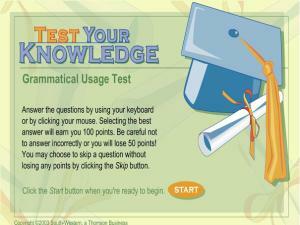 An excellent site to test your knowledge and make sure your learning is on track. 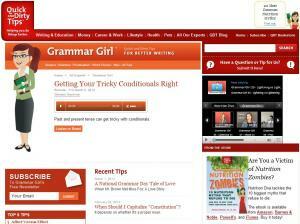 Provides many tips on different grammar topics. Some of them comes with audio and transcript. See if you can spot the most common errors in grammar use. Answer each question [15 questions total] and then submit your answers for instant results. Any incorrect answers can be reviewed with an explanation for why it was not the correct answer choice. Grammar-Quizzes is a comprehensive English language learning resource that provides focused contrasts of grammatical points (paired elements), examples, explanations and self-study quizzes with feedback. 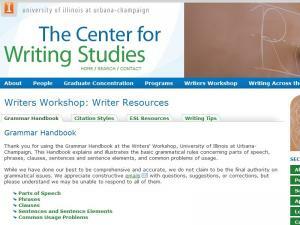 Grammar points are listed both by grammar term and by word on the index page. This Grammar collection covers topics like Common Spelling Mistakes, Verb Tenses and the Parts of Speech. While this site is reliable and thorough, it is very wordy. Advanced learners with specific questions or issues will easily benefit from this site, but beginning students might be overwhelmed. 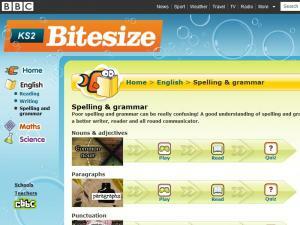 This a great site with a variety of quizzes, practice, games and activities. 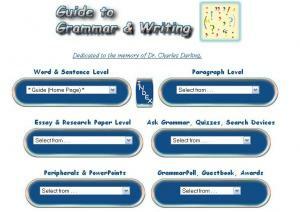 Choose the grammar topic that you would like to work on and click start to begin. 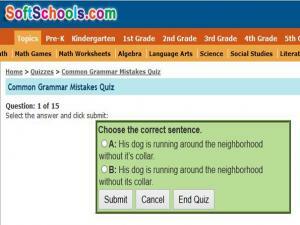 This site tests your grammatical knowledge with 25 sentences to correct. And you are given a full explanation for each answer even if you get it right! 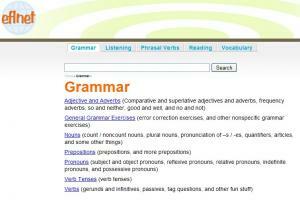 This site covers all aspects of grammar, including verb tenses, adjectives, adverbs, prepositions and pronouns. 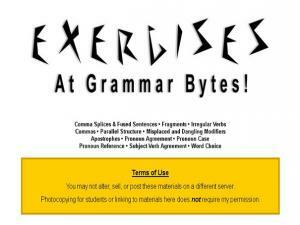 Each grammar topic has full notes and lots of examples. There are also lots of different text exercises to do for each grammar point to help you check your understanding. 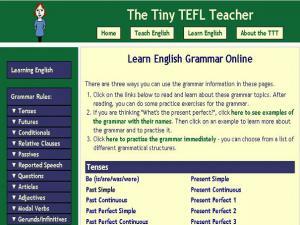 The Tiny TEFL Teacher is a website is for students who want to learn English grammar. 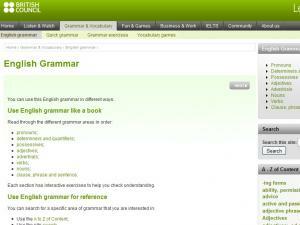 If you want to learn grammar, there are English grammar explanations and practice. Or if you are studying for the FCE exam, try the FCE exam practice! A good site that offers short, simple quizzes on all the key Grammar points for you to check your level of understanding and see where you need to revise or practice. The quizzes are divided into an Easy section and a Harder section. This website provides tidy, well-organized and concise grammar lessons and exercises for all levels of English language learners. This reference section from the British Council provides brief explanations of 48 of the more common areas of grammar, each with an activity to help you learn. 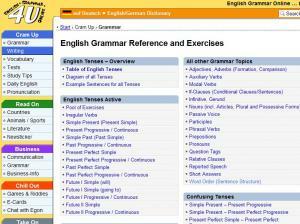 This site has over 1,000 simple activities for ESL learners to help practice all the main grammar points in English. The quizzes are easy to use and have a drop-down box that shows you the correct answer. Activities are divided by grammar categories and Ability Level (Easy, Medium or Difficult). Great for a quick topic refresh, or to check that you have understood an individual grammar point. 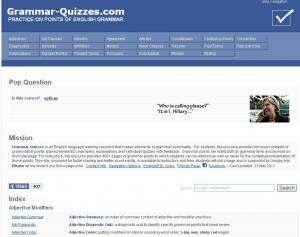 This site has loads of quizzes available to practice your grammar skills. It is split into ability levels and grammar topics. Play a game and see how many point you can score! Did you know that you can learn grammar and have some fun at the same time? Practice grammar with these British Council exercises and if you find any of them difficult follow the link to the quick grammar reference pages where you can get help. 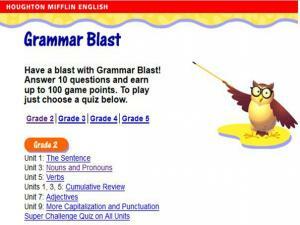 There are 10 pages listed with grammar games to help with all the main grammar topics. 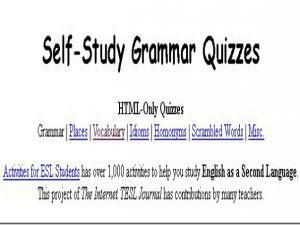 This site has quizzes for all the key grammar points, as well some key vocabulary topics. Each category comes with Notes, explaining the grammar or vocabulary point and provides some examples. 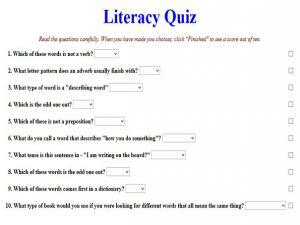 You can take the Quiz, either as an online test or download it as a pdf file.